Bill writes: I’d like to work a chili into my repertoire. I’ve made a handful over the years, but nothing has stuck. Something a little different would be nice, but not too different (my teenage kids will be part of the dining population; also, I’d like it to be beef, not turkey or chicken please). Thanks! 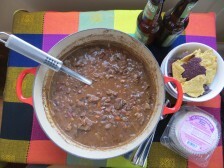 –Stew-y: Cutting the beef large (about 1 1/2 inch chunks) give this chili some wintry substance and heft. It also means that the beef can hold up to slow cooking, which, in turn, allows the flavors of the surrounding broth to intensify. 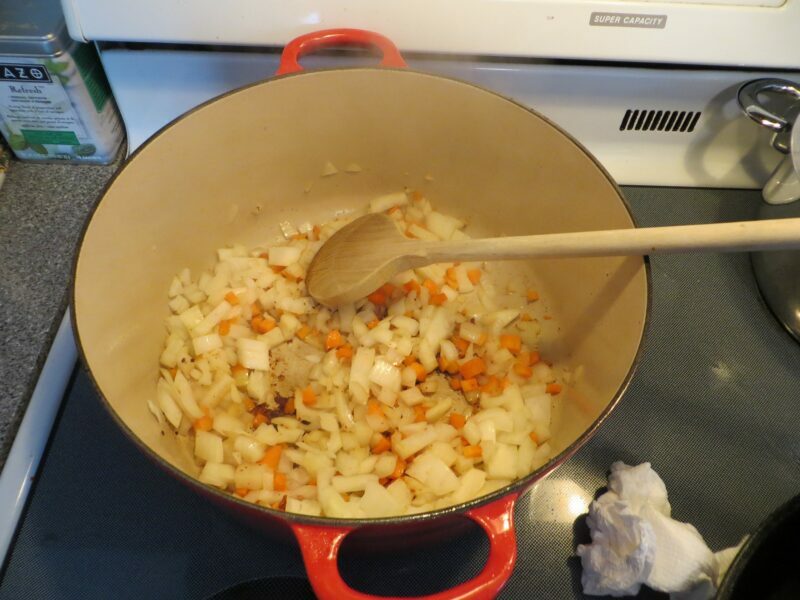 There are a couple of other stew elements here: I dredge the beef chunks in flour, which gives them a protective coating and also forms a faux-roux (thickening up the broth). And sweating diced vegetables (carrots and onions) gives the broth balance and depth. 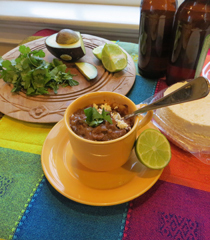 – 3x the chiles and beans: Varying these elements isn’t intended to be fussy or precious; rather working in a mix of beans and chiles offers up some complexity. You can go with just 1 kind of bean (red kidneys would be my suggestion) or even use canned if you feel so moved. But dried beans are cheap and if you do get a couple of varieties (cannellini, black and red kidney here), it will only serve as further encouragement to use up the remainders in other preparations (or chilis). For heat, I also use both canned and dried chipotles as well as some fresh Thai chiles. Same deal, keep it simple if you like, but the variety makes things more interesting. – Garnish. A sprinkling of one or two sprinklables will add some freshness, texture, and color to a dish that, no matter how good, can be monotonous once you get halfway through the bowl. I like crumbled queso fresco, fresh cilantro and a squeeze of lime. If you have, avocado or crumbled tortilla chips are also a nice touch. 1. Cook the beans (soak first if you can): If you have the forethought, soak the beans (if not, just rinse and cook them following the instructions below). Set 2 cups dried beans (I went with 3/4 cup each black beans, kidney beans, and cannellini) in a large bowl and cover with cold water by a couple of inches. Let sit out overnight. 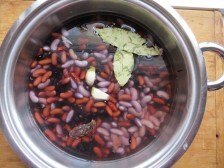 The next day, drain the beans, rinse well and set in a large pot. Cover with cold water by a couple of inches. Add a couple garlic cloves, 2 bay leaves, and 1 dried chipotle chile. Bring to a boil, reduce to a simmer, and cook (over medium low heat), stirring occasionally (and adding more water if the level starts to drop), until the beans start to become tender, about 1 hour; note, they don’t need to become totally soft as they will cook more in the stew below. 2. Brown the beef : Cut 2 1/2 lb. 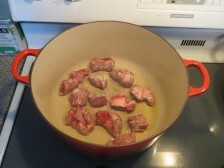 boneless chuck roast into medium chunks (about 1 1/4 inches), trimming and discarding any large fatty patches or gristle. Sprinkle generously with kosher salt and pepper (about 2 tsp. and 1 tsp. ), then dredge in all-purpose flour (1 cup), shaking off any excess. Heat a large, heavy-based Dutch oven over medium-high heat. Add 2 Tbs. olive oil and once it’s shimmering hot, add half of the beef, evenly spaced. Cook without touching for 1 to 2 minutes until the beef browns and easily releases when you lift up a corner. Flip, brown the other side, 1 to 2 minutes, and transfer to a large plate. 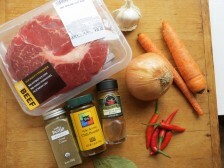 Add another drizzle of oil, if needed, and cook the remaining beef in the same manner; transfer to the plate. 3. Make the broth and simmer: Lower the heat to medium, add 2 slices bacon (2 oz., cut into thin strips) and cook, stirring, until it renders much of its fat, 3 to 4 minutes. 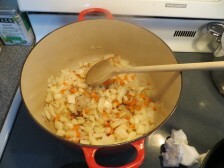 Add 1 Spanish onion (cut in 1/4-inch dice), 1 carrot (cut in 1/4-inch dice), and 1 jalapeno (chopped; or 2 Thai chiles), sprinkle lightly with salt, and cook, stirring, until the vegetables begin to soften and brown lightly, about 4 minutes. Add 2 Tbs. tomato paste, 2 Tbs. chili powder, 2 tsp. ground cumin, and 1 tsp. dried oregano. Cook, stirring, until the spices sizzle steadily and become fragrant, about 1 minute. Add 3/4 cup beer (or white wine) and cook, stirring to incorporate any browned bits on the bottom of the pot, until the liquid almost completely cooks off, 1 to 2 minutes. Ladle the beans and 1 cup of their juice into the pot along with 2 chipotle en adobo (minced), 2 Tbs. adobo sauce (from the can), and 3 Tbs. cider vinegar. Bring to a simmer and add the beef (and any of their juices). Adjust the heat to a light simmer (medium-low on my stovetop), cover, and cook, stirring occasionally, until the beef becomes completely tender and the broth intensifies, about 1 1/2 hours. 4. Garnish and serve: Season to taste with more salt, pepper, vinegar, or chipotle. Serve with your choice of toppings (see note above). Note: Cool to room temperature and then refrigerate for up to 5 days or freeze for up to 3 months.